Does anyone know if there are canon rules or even house rules in ISaW for sending out expeditions to discover new worlds and to set up colonies on them? I remember that the Far Lookers were a major faction in the Taurian Concordat during the 3rd Succession War era, and presumably all the Periphery States were expanding outwards before the Star League conquered them in the Reunification War. I know the costs for upgrading worlds are on ISaW p348, but I'm looking for any data on the cost of setting up new worlds from scratch. Also I heard there were runes for tech reserch and advancement in ISaW. Any word on where I can find them? I would also say the Lyrans could have done it in a Empires Aflame situation- IIRC the fluff was they turned towards devouring parts of the RWR rather than pushing further out their periphery border. Rules for technology and research (as well as espionage and Comstar) are in Second Succession War. I'm not aware of any rules, house or otherwise, for developing colonies on the scale of ISaW. As a wargame, it would have to be prohibitively expensive/incredibly long term investment to expand that way otherwise players will just do that, rather than... fighting wars. An alternative may simply be to sorta do what the old Federation and Empire game did, and have a pool of exploration ships that roll each month/turn and once enough points build up, a new colony is established/absorbed. Heck, you could even give the more exploratory powers more dice on the roll (like the Federation did), and less for the other powers. You'd also have to keep adding worlds to the map, or perhaps re-adding "lost" worlds that were destroyed during the 1sw and 2sw would be easier. Thanks for the advice about Second Succession War,Epic. I bought the PDF and looked through the ISAW rules and found them pretty interesting. I'm not familiar with Federation and Empire. let alone the exploration rules. 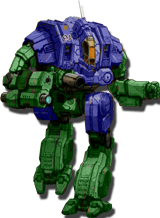 On the other hand I like the idea of dedicated exploration groups - they could be built like Combat Commands except the base 'Mech regiment is actually a construction group equipped with IndustrialMechs or ExplorerMechs like the Marco in TRO: Vehicle Annex, and add extra units as desired. Want to have a survey group that operates out of vehicles like the Pinto VTOL and the Chevalier wheeled tank? Buy an armour regiment. Want surveyors who operate on foot? Buy them as an infantry regiment. And so on. Then apply the modifier for the cost of JumpShips to give them transport capacity, and you're done. For the actual exploration mechanics maybe have something like sending an Exploration Command to a hex and then rolling for the presence of a suitable star system (with a hefty modifier if there is known to be a star system in that hex, like the worlds lost in the First or Second Succession War you mentioned). If there is a suitable system then roll to see if there is a suitable world to colonise, modified by the additional units added to the Exploration Command such as infantry, armour etc (the 'Mech regiment doesn't give bonuses, it just lets the survey attempt take place), If the world is suitable for colonisation then the world can be colonised, starting as an Other World at the cost of disbanding the Exploration Command to represent the cost of setting up infrastructure and so forth. So it's nowhere near as cost effective as conquering an existing world, but if the player doesn't want to risk provoking another player then it's an option. Also, you mentioned having to keep adding worlds to the map if players used this option. Are there any interstellar hex maps already released for ISAW? Scroll down and you will see the hex maps per era, for 1st, 2nd SW and 3025 set up. note also the differences in how much RP worlds generate in each era. See First Succession War, Second Succession War and Interstellar Operations tables for details. The one detail is that it causes the larger states to expand faster than smaller ones on an overall basis (since larger states produce more points than smaller). Is there a way to balance that effect, so worlds within a certain range from a capital (national or smaller) are cheaper to colonize? This would mean larger nations have to establish sub-capitals to continue their expansion, while smaller nations can try to rapidly catch up until they reach their range. By allowing the smaller states a chance to catch up it keeps the larger states somewhat careful about annoying or ignoring the little piranhas around them. Consult rules about how Comtech and Interdictions work with smaller states, and extrapolate that rule? I think it should be set up to encourage the FS/TC dynamic . . .
FS>Those are some nice colonies you have there . . . look to be real productive . . .
TC> . . . yeah, we put in some effort . . .
Colonization is a long term investment. Its cheaper for the big powers to just take worlds from their smaller neighbors UNLESS diplomacy or other things block them- so you do not really have to worry about powerhouses colonizing, but rather nibbling secondary powers to death. FS> What ya whispering about? TC> (monolog) Their on to us, quick what should we do? Also the main powers are usually concentrated on each other, and if they do decide to pay attention they have to be careful not to strip too many forces from their borders with the other main houses in case they looked vulnerable for raiding and attack from their old enemy. Colt, the only fan rules section that I could find like the ones mentioned by Epic and Idea Weenie was the Fan Rules and Design section. Isn't that only for fan rules relating to design of units like Mechs, ASFs etc? Well . . . I was not the one that said it, but I can answer- yes that is the section. It has sub-forums for the specific groups of designs but it has a general area for topics about rules from any level of the BTU.